I have a new heroine. 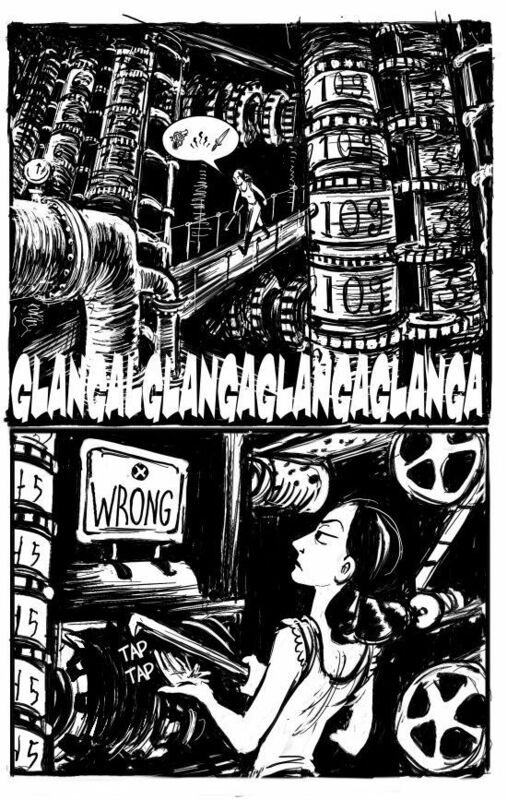 Not just Ada Lovelace but Sydney Padua who has created the most fantastic strip about Lovelace and Babbage over at 2D Goggles. I love also that I can quote women about the world’s most interesting stuff right now. See Cynthia Breazeal, Sherry Turkle, Donna Haraway, Katherine Hayles, Patti Maes, Elizabeth Grosz, Catherine Harding and of course, Sydney Padua, who just gets why you’ve got to love women with crowbars and computers. xkcd says it all. Our media representation of robots is completely missing the point. As is our 2 dimensional view of the world usually! We need 2D goggles! Sherry Turkle is Abby Rockefeller Mauz?? Professor of the Social Studies of Science and Technology in the Program in Science, Technology, and Society at MIT and the founder (2001) and current director of the MIT Initiative on Technology and Self, a center of research and reflection on the evolving connections between people and artifacts. Professor Turkle received a joint doctorate in sociology and personality psychology from Harvard University and is a licensed clinical psychologist. Professor Turkle is the author of Psychoanalytic Politics: Jacques Lacan and Freud’s French Revolution (Basic Books, 1978; MIT Press paper, 1981; second revised edition, Guilford Press, 1992); The Second Self: Computers and the Human Spirit (Simon and Schuster, 1984; Touchstone paper, 1985; second revised edition, MIT Press, 2005); and Life on the Screen: Identity in the Age of the Internet (Simon and Schuster, November 1995; Touchstone paper, 1997). Seminars and workshops at the Initiative on Technology and Self led to four edited collections, all published by the MIT Press, on the relationships between things and thinking. The first volume, Evocative Objects: Things We Think With, was published in Fall 2007. The second volume, Falling For Science: Objects in Mind, appeared in Spring 2008. The third volume, The Inner History of Devices, was published in Fall 2008. The final volume, Simulation and Its Discontents, followed in Spring 2009. Professor Turkle is currently completing a book on robots and the human spirit based on the Initiative’s 10-year research program on relational artifacts. I (andra) recommend reading some of Turkle’s papers on nascent robotics and relational artifacts. Although I’m not certain how to relate that to my art. lol. The 2009 TED Talk by Henry Markram describes how we now have the maths to model the neurocortical columns of the brain. He (and IBM) have built Bluebrain, a computer capable of modelling the brain. What’s most interesting to me are the philosophical questions raised; what is a person? where and how do we begin and end? and with whom can we communicate? even, why are we here? And especially, what can a robot think? And is our brain evolving outside of our body in augmented reality? These are all touched on in this fabulous TED Talk . It’s one of the best 15 minutes I’ve spent all year! I’ve added the official TED bio below to do better justice to the rich subject than I can. “In the microscopic, yet-uncharted circuitry of the cortex, Henry Markram is perhaps the most ambitious — and our most promising — frontiersman. Backed by the extraordinary power of the IBM Blue Gene supercomputing architecture, which can perform hundreds of trillions of calculations per second, he’s using complex models to precisely simulate the neocortical column (and its tens of millions of neural connections) in 3D. 66% used the stairs – at least on the first day. In any case, implications for Software are many. Do you want users to do something different? Make it appealing, make it surprising, make it fun. Weird, organic, very much alive, the wires just add to the sense of Frankenstein science. Highlight of the video is when it rolls. A new type of ‘uncanny valley’. But very cool and a neat hack. Love it. See http://spectrum.ieee.org/blog/robotics/robotics-software/automaton/irobot-sof… for more details. Proving that the internet?? ?s information doesn?? ?t always have to appear on-screen, Question Box brings the web?? ?s intelligence to offline communities. At the heart of the venture is a solar-powered intercom box that features a large green button. By pressing the button, a user is connected to an operator sitting in front of a computer. The caller asks a question and the operator does a web search to find the answer. Two Question Boxes are currently operational in the Indian state of Maharastra, where the first box was installed by California-based non-profit Open Mind in September 2007. In March 2009, the Applab Question Box service was launched in Uganda?? ?tweaking the model by enabling callers to contact call centre operators from their own mobile phones. Both services log previously answered questions in local databases, speeding up responses to future enquiries and providing information offline in case of lack of connectivity. Queried topics range from crop prices and cricket scores to exam results. Far too much of the commentary around internet for ‘third world’ as a transformative technology ignores the reality that voice is the ‘killer app’. Just the mobile phone by and large gives “access” to any other person on the planet. Adding internet to the equation is useful, sure, but assumes literacy and common reference points. This type of Oracle service is a really way to bring the ‘lookup’ advantages the rest of us have with the web to those without the advantages of internet access and/or (generally English) literacy. Brilliant idea. I also really like the idea of specialized “boxes” for different niche queries. This would tie beautifully into work by Reeves and Nass on how subconsciously we use all the heuristics of human relations with devices (i.e. information from specialist (devices) is considered more valuable than information from generalist (devices)) – the effect has been shown with TVs, computers, and other modern media.